The Portuguese manager has revealed that he mingled with supporters on their way to a Champions League clash. 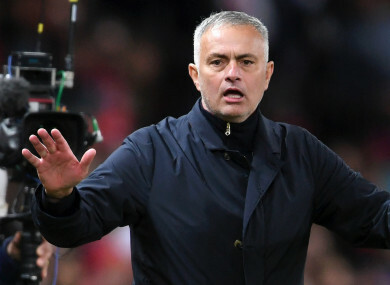 JOSE MOURINHO HAS revealed that he walked to Old Trafford ahead of Manchester United’s Champions League clash with Juventus as the Red Devils’ team bus once again got caught up in traffic. The Premier League outfit were fined €15,000 by Uefa after arriving late to their continental clash with Valencia on 2 October. In an effort to avoid a repeat of that situation, United tweaked their pre-match plans by moving their overnight accommodation from The Lowry to the Hilton Garden, which is less than half a mile from Old Trafford. United were, however, to endure more travel chaos on Wednesday, with a coach carrying playing and coaching staff taking over an hour to make its way through congestion. Mourinho, though, endured no such troubles as he took the decision to mingle with supporters making their way through the streets of Manchester. The Portuguese told BT Sport on his journey: “As you know we changed hotel, the hotel is just around the corner. The players are in the bus for 45 minutes, and I walked, with a hoodie, in the middle of the fans, nobody recognised me. “I took two minutes and what I did in two minutes the players… they cannot do 45 minutes on the bus. Email “Mourinho walks half a mile to Old Trafford as Man United bus stuck in traffic again”. Feedback on “Mourinho walks half a mile to Old Trafford as Man United bus stuck in traffic again”.